Talk about serendipity. I’ve been craving a good scone lately and happened across this gluten free (though not vegan) mix at Homegoods TJ Maxx in the packaged foods section. The sale price was $3 but it retails for around $6. The instructions are super easy. The mix goes in a bowl and is stirred together with some oil and water until a sticky dough forms. They aren’t lying – it does get very sticky. The box says it yields 10 scones. This is accurate though very modest size ones. As is personal tradition, the whoopie pie pan was used. The mix filled 18 slots heaping, comfortably. Normally the recommended cook time is 13-15 minutes. Since whoopies are smaller, we grabbed them out at 11 minutes in. Next time I’ll pull them out at around the 10 minute mark so as to not overcook. 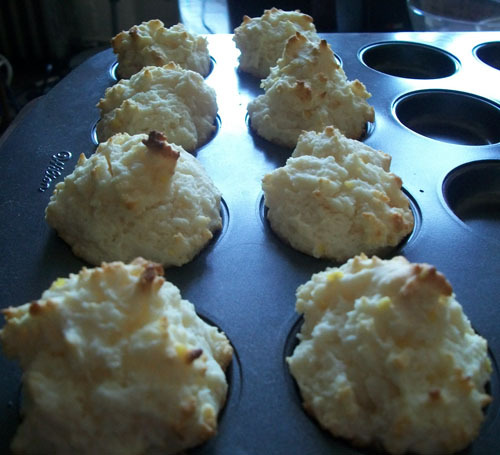 The finished product is delicious if a bit different than traditional scones. The texture is chewier and the dough moister than expected. 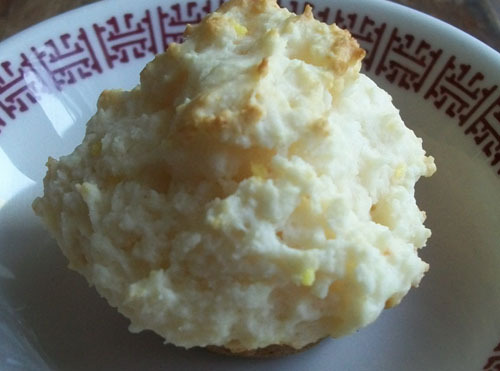 The lemon flavor and sweetness is just right and the dough features small bits of the fruit. They give that pleasing dryness that is a hallmark of baked items like scones, soda and short bread. 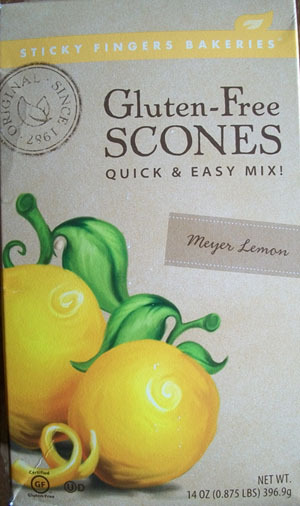 Sticky Fingers Gluten Free mix is excellent and would convincingly win over sconeheads everywhere. Totally random that they have food right? Thanks for the comment. lol–yes, totally random. housewares, shoes, underwear, blue jeans, and scone mix! Ha, I just made these yesterday (in the lemon flavor as well as blueberry) and was going to review them this week 🙂 I took them to a bridal shower and everyone (even non-GF eaters) really liked them. That’s a funny coincidence. How was the blueberry? I was considering adding fresh blueberries to the lemon flavor. Glad they went over well at the bridal shower. Let me know when your post goes up. I’ll link to it (nice to include opinions from trusted sources). Hopefully, I’ll get to it this week! I’ve been so busy with life that I haven’t had much time for blogging. I didn’t really like the blueberry – it tasted too artificial. But I think adding fresh blueberries to the lemon would be a nice touch! Great find! Can’t wait to give it a try! I think you’ll like it though it’s best to eat them within a couple of days. Cheers and thanks for the comment.